The Best AutoCAD Hip Tip Ever! And the hook answer! The staircases are so narrow in the buildings it is impossible to get some types of furniture in through the building (sofas, beds, etc). Consequently they use the hooks to hoist the furniture in through the windows...really...imagine that! They literally thread a rope or cable through the hook (along with a lifting wheel) and pull the furniture up. Piano sales must be pretty slow in Amsterdam! I'm guessing that "some assembly required" is actually a good thing in these tight (but adorable) houses. We all know the frustration from aiming for the Escape key and then accidentally hitting that pesky F1 key instead! Argh!!! Let's hear an Argh from all of you! You have to wait for AutoCAD Help to appear...la-la-la...which sometimes takes hours (or at least feels that way). I have heard many creative solutions to this irritation - including one user who created a little cardboard key protector he placed around the F1 key to ensure it never happened again! My solution is much more practical. Today I'll address the issue in AutoCAD 2006 - tomorrow I'll address the issue in AutoCAD 2005 or before (so stay tuned). 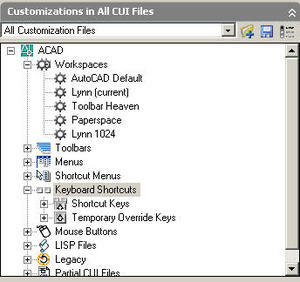 You AutoCAD 2006 users will execute the new CUI command. Our first step is to locate the Keyboard Shortcut section in the upper left corner. Select and expand the Keyboard section as seen in the figure below. 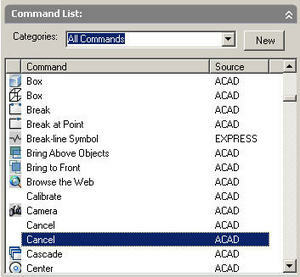 Okay - you've found the section - now you need to find the Cancel command from the list of AutoCAD commands in the lower left corner. Key in a "C" to quickly locate all the commands that start with a "C" and then you will easily see "Cancel". The next step is easy...simply drag and drop the Cancel command up to beneath Shortcut Keys as seen below. It doesn't matter where it lands as long as it's underneath Shortcut Keys. We aren't finished yet though...now we need to tell AutoCAD which key (F1) we want to assign Cancel to. On the lower right hand side of the CUI command you'll see a section called "Properties". Select the Keys line shown below and you'll see a button with ellipsis on it appear. Select the ellipsis button as indicated above and you're almost there! 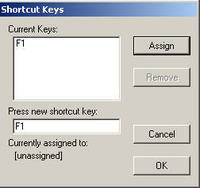 Now it's as easy...Select the box underneath "Press new shortcut key" and simply hit the F1 key. 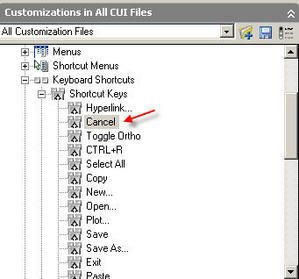 Hit OK to get out of the Shortcut Keys dialog and another one to exit the CUI. Voila! Your F1 key is now an extra Escape key. So if you're a bad shot (perhaps too much caffeine?) you won't have to wait around for the Help command to load anymore. Is this not one of the best Hip Tips ever? Enjoy!